The Vikings and Bears have a combined 9-1 record in league competition; they face each other April 11. DOWNEY – The Downey High School girls’ soccer team finished their season in the first round of the 2019 C.I.F. Division 3 Southern California Regional Girls Soccer Championships with a 2-1 loss at Grossmont High School in El Cajon on February 26th. The bracket featured 1.) Oak Hills/ 8.) San Diego, 4.) Mission Oak/ 5.) Culver City, 3.) Grossmont/ 6.) Downey and 2.) Flintridge Sacred Heart/ 7.) New West Charter. Flintridge Sacred Heart defeated Culver City 3-0 in the final on March 2nd. Downey finished the season with an overall record of 17-7-5 and a San Gabriel Valley League record of 8-1-1. The Vikings finished in second place behind eventual league champion, Warren (18-6-4, 9-0-1). 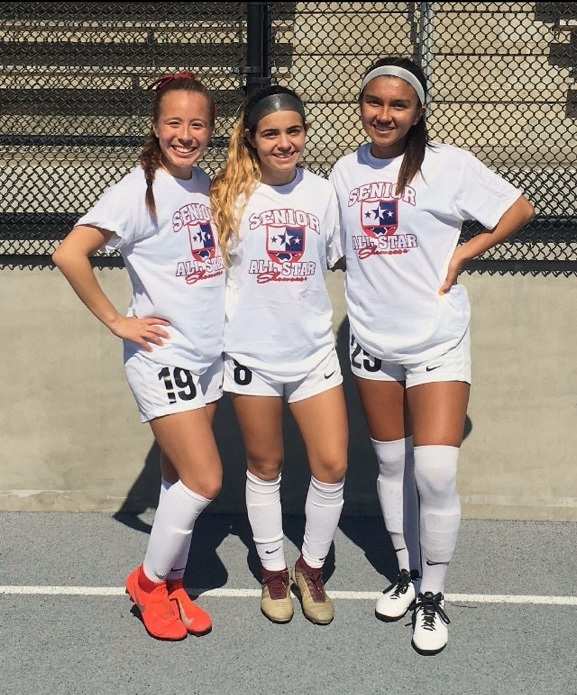 Three senior players of the Downey High School girls’ soccer team have been competing in an all-star tournament. Roxanne Victoria, Amaya Gonzalez and Alice Hernandez have been competing in all-star competitions, most recently at Newport Harbor High School in Irvine. The three senior midfielders are also entertaining scholarships to various universities. Indiana, Long Beach State, Stanford, Occidental College and Colorado are just five of the many schools currently showing interest in the trio. Coach Aguiniga and his staff are extremely proud of his players’ accomplishments. DOWNEY LACROSSE: The Downey High School boys’ lacrosse team currently has an overall record of 3-1 and will begin South Bay League play on March 20th when they play Culver City at Culver City. The Vikings defeated Roosevelt at Roosevelt 10-6 on February 27th, defeated Damien at Downey 6-5 on March 1st, were defeated by Redondo Union at Redondo Union 14-1 on March 4th and defeated Beverly Hills at Beverly Hills 6-5 on March 7th. Downey hosted Beverly Hills at Downey on Wednesday (score unavailable at press time). Downey competes in the South Bay League against Santa Monica and Culver City. At the time of this writing Santa Monica is 3-1 overall, Downey is 3-1 overall and Culver City is 1-4 overall. The Vikings are scheduled to play Culver City at Culver City on March 20th, Santa Monica at Santa Monica on March 27th, Damien at Damien on April 5th, Roosevelt at Downey on April 12th and El Segundo at Downey on April 17th. The Vikings finished last season with an overall record of 4-12 and a South Bay League record of 0-4. Head Coach Bryant Hernandez, his staff and players are all looking forward to the 2019 lacrosse season. WARREN SOFTBALL: The Warren High School softball team currently has an overall record of 4-3 and will begin San Gabriel Valley League play when they travel to play Lynwood at Lynwood on March 26th. In preseason action, the Bears competed in the Savannah Showcase where they finished 4-1. Warren defeated Villa Park, Santa Fe, La Serna and Culver City with their only loss coming to La Mirada 3-2 in eight innings. The Bears were defeated by La Serna at La Serna 7-1 on March 15th and will travel to La Palma Kennedy to face the Fighting Irish on March 19th. Warren is also scheduled to compete in the La Mirada Tournament on March 23rd and March 30th. As mentioned, the Bears will travel to Lynwood to face the Lady Knights on March 26th, will travel to Paramount to face the Lady Pirates on March 28th, will host Gahr at Warren on April 2nd and will travel to cross-town rival Downey on April 4th to play in the first of their two scheduled meetings. Warren will finish their first round of league play when they host Dominguez at Warren on April 9th. Warren finished last season with an overall record of 17-13 and was 6-4 in league play. The Bears were defeated by South Hills 4-3 in the first round of the C.I.F. Division 2 playoffs. Coach Starksen, her staff and players are all looking forward to the start of the 2019 S.G.V.L. season and competing for a league title. Gahr and Downey will once again be the teams to beat in league play. WARREN BOYS VOLLEYBALL: The Warren High School boys’ volleyball team currently has an overall record of 4-5 and will begin San Gabriel Valley League play when they host Lynwood at Warren on March 21st. Warren finished the Redondo Union Tournament on February 22nd and 23rd with a record of 1-4. The Bears were defeated by St. John Bosco at St. John Bosco 3-1 on March 5th, defeated Santa Fe at Santa Fe 3-0 on March 7th and defeated Norwalk at Norwalk 3-1 on March 21st. Warren will host Lynwood at Warren on March 21st, will travel to face Paramount at Paramount on March 26th, will host Gahr at Warren on March 28th and will travel to cross-town rival Downey on April 2nd for the first of their two scheduled meetings. Coach Lane, his staff and players are all looking forward to the start of S.G.V.L. play. WARREN BASEBALL: The Warren High School baseball team currently has an overall record of 12-2 and are 0-1 in San Gabriel Valley League play. Warren swept a doubleheader from Hoover at Hoover 15-0 and 10-0 last Saturday in non-league play. The Bears were defeated by Paramount at Warren 1-0 on Monday and traveled to Paramount on Wednesday for their rematch (score unavailable at press time). The Bears will travel to Dominguez on Monday and will then host the Dons next Thursday at Warren. Coach Pearson, his staff and players are all looking forward to 2019 league play. DOWNEY – The Downey High School boys’ swim team currently has an overall record of 4-0. The Vikings defeated Cal, 130-40, on February 19th, defeated Ocean View, 116-37, on February 21st, defeated Lakewood, 133-35, on February 26th and defeated Santa Fe, 123-46, on February 28th. The Vikings have picked up right where they left off last season. The Vikings have been led by returning seniors Nathan Lopez, Christian Gonzalez, Jesus Murguia, and Jose Salazar. New senior additions of Adrian Buenrostro and Jason Camacho are contributing as are juniors David Tonne, Adrian Caballero and Nathan Amador. Sophomores Tomas Marquez and Armando Flores are stepping up as is freshmen Jose Jaime. Coach Delhousay, his staff and swimmers are all looking forward to a competitive season with non-league meets against the La Serna Lancers on March 7th (results unavailable at press time) and the Cerritos Dons next Wednesday. DOWNEY BOYS VOLLEYBALL: The Downey High School boys’ volleyball team currently has an overall record of 6-3 and will begin San Gabriel Valley League play when they travel to Paramount to play the Pirates on Thursday, March 21st. The Vikings were defeated by La Serna at La Serna 3-0 on February 20th in their season opener and competed in the Redondo Union Tournament February 22nd and 23rd where they finished with a record of 4-2. Downey defeated Lakewood 2-0 on February 22nd, defeated Torrance 2-0 on February 22nd and were defeated by San Marcos 2-0, also on February 22nd. The Vikings were defeated by Newbury Park 2-0 on February 23rd, defeated Calabasas 2-0 on February 23rd and defeated Thousand Oaks 2-0, also on February 23rd. Downey defeated Claremont at Downey 3-0 on February 28th. The Vikings traveled to La Palma Kennedy on Wednesday for their match against the Fighting Irish (score unavailable at press time). The Vikings are also scheduled to play Norwalk at Downey on March 13th and will travel to El Dorado on March 19th for their final preseason game. Downey finished last season with an overall record of 26-5-1 and were 10-0 in S.G.V.L. play. The Vikings are the defending C.I.F. Division 3 champion after they defeated Tustin in the championship final 25-23, 22-25, 25-17 and 25-23. Coach McCarthy, his staff and players are all looking forward to the 2019 volleyball season. WARREN BOYS VOLLEYBALL: The Warren High School boys’ volleyball team currently has an overall record of 2-5 and will begin San Gabriel Valley League play when they host the Lynwood Knights at Warren on Thursday, March 21st. The Bears defeated Bellflower at Warren 3-0 in their league opener on February 19th and competed in the Redondo Union Tournament where they finished with a record of 1-4. The Bears defeated Carson 2-1 on February 22nd, were defeated by Thousand Oaks 2-1 on February 22nd and were defeated by Los Alamitos 2-0, also on February 22nd. Warren was defeated by South Torrance 2-1 on February 23rd and was defeated by Lakewood 2-0, also on February 23rd. The Bears were defeated by St. John Bosco at St. John Bosco 3-1 on Tuesday night. Warren traveled to Santa Fe to play the Chiefs yesterday and will host the Norwalk Lancers next Tuesday in their final preseason game. Warren finished last season with an overall record of 17-6 and were 8-2 in league play. The Bears finished in second place in league play behind cross-town rival Downey, respectively. Warren was defeated by Arroyo Grande 3-1 in the second round of the C.I.F. Division 2 playoffs. Coach Lane, his staff and players are all looking forward to the 2019 volleyball season. WARREN BASEBALL: The Warren High School baseball team currently has an overall record of 9-1 and will begin San Gabriel Valley League play when they host Paramount at Warren next Monday. The Bears are currently competing in the Poly Classic where they have a record of 3-0. Warren defeated Bell 4-0 on February 27th, defeated South Gate 11-0 on March 1st, defeated Roosevelt 6-0 on March 5th and played Poly of Sun Valley on Wednesday (score unavailable at press time). The Bears will play a doubleheader at Hoover tomorrow. The first game is scheduled for 9:00 a.m. and the second game is scheduled for 12:00 p.m.
Coach Pearson, his staff and players are all looking forward to the 2019 baseball season and competing for a S.G.V.L. championship and playoff birth. Gahr and cross-town rival Downey will once again be the teams to beat in league play. WARREN SOFTBALL: The Warren High School softball team currently has an overall record of 4-3 and will begin San Gabriel Valley League play when they travel to Lynwood on March 26th. The Bears were defeated by Mayfair at Warren 7-5 on February 28th and were defeated by La Serna at La Serna 7-1 on March 5th. Warren is scheduled to play La Palma Kennedy at La Palma Kenney on March 19th and will also compete in the La Mirada Tournament on March 23rd and 30th. Coach Starksen, her staff and players are all looking forward to the 2019 softball season and qualifying for postseason play. Gahr and cross-town rival Downey will once again be the teams to beat in league play. DOWNEY – The Downey High School girls’ soccer team saw their season come to an end last Saturday night against Flintridge Sacred Heart at Downey 1-0 (2 OT). The Lady Tologs scored the game’s lone goal in the second overtime period and the Lady Vikings couldn’t find the equalizer. Flintridge Sacred Heart (11-4-3) advanced to the C.I.F. Division 3 championship game where they will play Oak Hills (21-2-2). Oak Hills defeated Culver City 1-0 on February 16th to advance to the final. The C.I.F. Division 3 championship game is scheduled for tomorrow night at 5 p.m. at St. Francis High School in Flintridge. Downey defeated West Ranch at Downey 2-1 on February 6th in their first-round game, defeated Bishop Montgomery at Bishop Montgomery 1-0 on February 8th in their second-round game and defeated Sherman Oaks Notre Dame at Sherman Oaks Notre Dame 1-0 on February 12th in their quarterfinal round game. The Lady Vikings were then defeated in the semifinal round against Flintridge Sacred Heart at Downey 1-0 on February 16th. Downey finished their season with an overall record of 17-6-5 and a San Gabriel Valley League record of 8-1-1. The Lady Vikings finished league play in second place behind S.G.V.L. champion Warren (9-0-1). Coach Aguiniga, his staff and underclassmen will now turn their attention towards reloading for next season. WARREN GIRLS BASKETBALL: The Warren High School girls’ basketball team has seen their season come to an end. The Lady Bears were defeated by Rolling Hills Prep 57-26 on February 13th in the quarterfinal round of the C.I.F. Division 2AA playoffs. Warren defeated St. Paul 52-41 on February 7th in the first round to advance and defeated Los Altos 46-45 on February 9th in the second round to advance to the quarterfinal round. Rolling Hills Prep defeated Roosevelt 47-45 in the semifinal round on February 15th to advance to the title game against Orange Lutheran tomorrow. Orange Lutheran defeated Village Christian 44-31, also on February 15th, to advance to the title game. The C.I.F. Division 2AA championship game will be played tomorrow. The Lady Bears finished their season with an overall record of 12-15 and a San Gabriel Valley League record of 5-5. Coach Palmer, her staff and 11 underclassmen will now turn their attention towards next season. WARREN BOYS BASKETBALL: The Warren High School boys’ basketball team concluded its season when the Bears were defeated by Santa Clarita Christian 96-63 on February 14th in the quarterfinal round of the C.I.F. Division 3AA playoffs. Warren defeated Valley Christian 61-46 on February 8th in the first round to advance and defeated La Habra 50-45 on February 12th in the second round to advance to the quarterfinal round. Santa Clarita Christian defeated Highland 52-50 in the semifinal round on February 16th to advance to the title game against Rolling Hills Prep tomorrow. Rolling Hills Prep defeated Oxnard 64-46, also on February 16th, to advance to the title game. The C.I.F. Division 3AA championship game will also be played tomorrow. The Bears finished their season with an overall record of 20-7 and a San Gabriel Valley League record of 8-2. Coach Leflore, his staff and 10 underclassmen will now turn their attention towards next season. BOSCO WRESTLING: The St. John Bosco wrestling team finished in second place at the C.I.F. Southern Section Master’s Meet held at Cerritos College last weekend. The Braves will be sending eight wrestlers to compete at the state meet in Bakersfield this weekend. At the Master’s Meet, Servite finished in first place with 185 points, St. John Bosco finished in second place with 175.5 points, Temecula Valley finished in third place with 109 points, Santa Ana Calvary Chapel finished in fourth place with 97 points and Bishop Amat finished in fifth place with 93.5 points to round out the top five finishers, respectively. Northview finished in sixth place with 93 points, Esperanza and San Marino finished in a tie for seventh place with 77.5 points, Palm Desert finished in ninth place with 73.5 points and Fountain Valley finished in tenth place with 71.5 points to round out the top ten. St. John Bosco had several placers place at the Master’s Meet. Antonio Lorenzo (120) finished first by defeating Richard Castro-Sandoval of Santa Ynez 11-1. Timothy Levine (132) finished fifth after he defeated Sunny Luna of Victor Valley via forfeit and Oscar Arrand (138) finished seventh after he defeated Isaac Samano of Don Lugo 5-2. Cael Valencia (145) finished first after he defeated Luka Wick of San Marino 5-3 and Sonny Santiago (152) finished second after he was defeated by Troy Mantanona of Palm Desert via pin at the 3:57 mark of the second period. Louis Rojas (160) finished second after he was defeated by Max Wilner of Fountain Valley 11-3, Miguel Beltran (170) finished ninth after he defeated Ndifor Tabulkum of Roosevelt 7-1 and Nathan Haas (182) finished first after he defeated Nico Hanessian of Simi Valley 13-2. Downey’s Matthew Morales (132) placed 11th after he defeated Jacob Fuerte of Hillcrest. Morales did not qualify for the state meet because only the top nine wrestlers in each weight class move on. Warren’s Salvador Alvarez (120) and Carlos Durazo (160) both qualified for the Master’s Meet but did not place. MIDDLE SCHOOLS: The fourth rotation of middle school sports is scheduled to start on Monday, February 25th. Boys’ baseball and girls’ softball will be featured and four more city championships will be up for grabs. There will be a varsity and junior varsity baseball team as well as a varsity and junior varsity softball team from each of the four schools competing. During the first week of competition Doty and Sussman will play a home and away series and Griffiths and Stauffer will play a home and away series. During the second week of competition Doty and Griffiths will play a home and away series and Stauffer and Sussman will play a home and away series. In the third and final week of competition Doty and Stauffer will play a home and away series and Griffiths and Sussman will play a home and away series. A total of six games will be played by each team to determine a city champion. Last season, Griffiths won both varsity and junior varsity baseball as well as girls’ varsity softball while Doty won girls’ junior varsity softball. Doty currently has 7 city championships, Griffiths has 5.5 city championships, Stauffer has 4 city championships and Sussman has 2.5 city championships. The fifth and final rotation of middle school sports will feature track and field where six more city championships will be up for grabs. Doty has currently won five straight Champions Cup trophies and looks to add a sixth. DOWNEY – The Downey High School girls’ soccer team has advanced to the semifinal round of the C.I.F. Division 3 playoffs. The Lady Vikings defeated West Ranch at Downey 2-1 on February 6th in their first-round game, defeated Bishop Montgomery at Bishop Montgomery 1-0 on February 8th in their second-round game and defeated Sherman Oaks Notre Dame at Sherman Oaks Notre Dame 1-0 on Tuesday in their quarterfinal round game. Lady Viking Amanda Perez scored the game winner in the first half against Sherman Oaks Notre Dame. Downey will play against Flintridge Sacred Heart (10-4-3) at Downey at 7 p.m. tomorrow in the semifinal round. Flintridge Sacred Heart defeated South Torrance in their quarterfinal round game 3-2 to advance. The Lady Vikings are currently 17-5-5 overall and are one win away from advancing to the C.I.F. Division 3 championship game on February 22nd or 23rd. DOWNEY GIRLS WATER POLO: The Downey High School girls’ water polo team saw their season come to an end last Thursday against El Segundo 9-5 at the Downey Aquatics Center. The Lady Vikings were eliminated in the second round of the C.I.F. Division 4 playoffs. El Segundo (20-5) was then eliminated by Sunny Hills at El Segundo 8-7 in their quarterfinal round game on February 9th. Downey defeated Millikan at Downey 8-6 in the first round on February 5th to advance to second round play. The Lady Vikings finished their season with an overall record of 20-7 and a league record of 6-0. Downey is the 2019 San Gabriel Valley League champion. WARREN GIRLS BASKETBALL: The Warren High School girls’ basketball team has advanced to the quarterfinal round of the C.I.F. Division 2AA playoffs. The Lady Bears defeated St. Paul at St. Paul 52-41 in their first-round game on February 7th and defeated Los Altos at Warren 46-45 in their second-round game on February 9th. Warren traveled to Rolling Hills Prep (21-3) on Wednesday for their quarterfinal round game against the Lady Huskies. The winner of this game will play the winner of the Huntington Beach/Roosevelt game on Friday. The Lady Bears are currently 12-14 overall and one win away from the semifinals. Coach Palmer, her staff and players are all looking forward to getting back to the C.I.F. championship game. The Lady Bears are the 2018 defending C.I.F. Division 3AA champions. WARREN GIRLS SOCCER: The Warren High School girls’ soccer team was eliminated by Vista Murrieta (14-3-3) at Vista Murrieta 3-0 on February 8th in the second round of the C.I.F. Division 2 playoffs. The Lady Bears defeated Lakewood at Warren 4-0 on February 6th to advance to the second round. Warren finished their season with an overall record of 18-5-4 and were 9-0-1 in San Gabriel Valley League play. Warren is the 2019 S.G.V.L. champion. Coach Dussan, her staff and players may be a little disappointed with a second-round exit from postseason play but they still played hard and had an excellent season. WARREN BOYS BASKETBALL: The Warren High School boys’ basketball team advanced to the quarterfinals of the C.I.F. Division 3AA playoffs with a win against La Habra at Labra 50-45 on Tuesday night. The Bears defeated Valley Christian at Warren 61-46 on February 8th to advance to the second round. The Bears played Santa Clarita Christian at Warren last night (score unavailable at press time) and will play the winner of the Highland/San Gabriel Academy game if they won Thursday night’s game. The Bears currently have an overall record of 20-6 and are the 2019 San Gabriel Valley League champions. WARREN BOYS WRESTLING: The Warren High School boys’ wrestling team had two wrestlers qualify for the Master’s Meet at the C.I.F. Individual Competition held at Brea-Olinda High School last weekend. Warren’s 120 pound wrestler Salvador Alvarez placed second and 160 pound wrestler Carlos Durazo placed fourth. Downey’s Matthew Morales was the only other wrestler, from Downey or Warren, to advance to the Master’s Meet after he placed second at 132 pounds. Warren’s Salvador Alvarez (120) is scheduled to wrestle Kobe Kim of Los Alamitos in his first round match, Carlos Durazo (160) is scheduled to wrestle Adan Torres of Indian Springs in his first round match and Matthew Morales (132) is scheduled to wrestle Michael Valdez of Santa Ana Calvary Chapel in his first round match. Master’s Meet competition will be held at Cerritos College this weekend and the state meet will be held at Rabobank Arena in Bakersfield next weekend. MIDDLE SCHOOL SPORTS: The third rotation of middle sports has concluded and eight more city championships have been claimed. Middle school student-athletes competed in boy’s and girls’ basketball and boys’ soccer. There were grade level teams for boys’ and girls’ basketball as well as a junior varsity and varsity boys’ soccer teams. The Sussman 8th grade boy basketball team is the city champion. The Pioneers finished with a record of 4-2. Doty and Stauffer finished tied for second with records of 3-3 and Griffiths finished fourth with a record of 2-4. The Doty and Stauffer 7th grade boy basketball teams were co-champions with records of 5-1 and Griffiths and Sussman tied for third with records of 1-5. The Doty 6th grade boy basketball team is the city champion. The Knights finished with a record of 6-0. Griffiths and Sussman tied for second with records of 3-3 and Stauffer finished in fourth with a record of 0-6. The Doty and Sussman 8th grade girls’ basketball teams are co-champions with records of 5-1. Griffiths finished in third place with a record of 2-4 and Stauffer finished fourth with a record of 0-6. The Doty 7th grade girl basketball team is the city champion. The Lady Knights finished with a record of 6-0. Stauffer finished second with a record of 3-3, Sussman finished third with a record of 2-4 and Griffiths finished fourth with a record of 1-5. The Stauffer 6th grade girl basketball team is the city champion. The Lady Spartans finished with a record of 5-1. Sussman finished second with a record of 4-1-1, Doty finished third with a record of 2-3-1 and Griffiths finished fourth with a record of 0-6. The Stauffer varsity soccer team is the city champion. The Spartans finished with a record of 5-1. Griffiths finished second with a record of 3-3 and Doty and Sussman tied for third place with records of 2-4. The Sussman junior varsity soccer team is the city champion. The Pioneers finished with a record of 6-0. Doty finished second with a record of 3-3, Stauffer finished third with a record of 2-4 and Griffiths finished fourth with a record of 1-5. With the third rotation now complete, Doty leads the race for the Champions Cup Trophy with 7 points, Griffiths is in second place with 5.5 points , Stauffer is in third place with 4 points and Sussman is in fourth place with 2.5 points. Up next is boys’ baseball and girls’ softball. Four more city championships are up for grabs. Track and field will follow baseball and softball and that will be the fifth and final rotation this year. DOWNEY – The Downey High School boys’ soccer team currently has an overall record of 16-4-4 and a San Gabriel Valley League record of 6-0-2. The Vikings tied Lynwood at Downey 1-1 (2OT) on January 24th, defeated Dominguez at Downey 6-0 on January 26th and defeated Warren at Downey 2-0 on January 28th. The Vikings played Gahr at Gahr on Wednesday and concluded their regular season schedule when they traveled to Paramount yesterday (scores unavailable at press time). The game against Paramount yesterday was for the league championship. At the time of this writing, Paramount is 7-0-1 and in first place in league play, Downey is 6-0-2 and in second place, Lynwood is 6-2-1 and in third place, Warren is 3-6 and in fourth place, Dominguez is 2-7 and in fifth place and Gahr is 0-9 and in sixth place. The Vikings have qualified for C.I.F. postseason play and will wait for the C.I.F. Division 1 playoff bracket to be released this weekend. Coach Mires, his staff and players are all looking forward to finishing league play on a strong note and making another deep run in the playoffs. DOWNEY GIRLS SOCCER: The Downey High School girls’ soccer team currently has an overall record of 13-5-5 and a San Gabriel Valley League of 7-1-1. The Lady Vikings defeated Lynwood at Lynwood 4-0 on January 24th, defeated Paramount at Paramount 7-1 on January 26th and tied Warren at Downey 1-1 (2OT) on Tuesday night. Downey hosted Gahr at Downey on Wednesday night in their league finale (score unavailable at press time). The Lady Vikings have qualified for C.I.F. Division 3 postseason play and will find out who and where they play this weekend. Coach Aguiniga, his staff and players are all looking forward to finishing league play on a strong note and making a nice run in postseason play. DOWNEY BOYS BASKETBALL: The Downey High School boys’ basketball team currently has an overall record of 20-8 and a San Gabriel Valley League record of 5-4. The Vikings defeated Dominguez at Dominguez 45-44 on January 23rd, were defeated by Lynwood at Downey 63-62 on January 25th and were defeated by Warren at Warren 57-55 on Tuesday night. Downey closed out their regular season schedule yesterday against Gahr at Gahr (score unavailable at press time). At the time of this writing, Warren is in first place in league play with a record of 7-2, Downey is in second place with a record of 5-4, Dominguez is tied for third place with Lynwood and Gahr with records of 4-5 and Paramount is in sixth place with a record of 3-6. Coach Shelton, his staff and players are all looking to finish league play on a strong note. The Vikings have already qualified for postseason play and will see who they play in the first round of the C.I.F. Division 3AA playoffs this weekend when brackets are posted. DOWNEY GIRLS BASKETBALL: The Downey High School girls’ basketball team currently has an overall record of 21-6 and a San Gabriel Valley League record of 8-1. The Lady Vikings defeated Dominguez at Dominguez 49-43 on January 23rd, defeated Lynwood at Downey 65-39 on January 25th and were defeated by Troy at Troy 47-28 on January 26th in non-league play. The Lady Vikings defeated Warren at Warren 63-48 on Tuesday and closed out their regular season schedule yesterday against Gahr at Gahr (score unavailable at press time). The Lady Vikings have already qualified for postseason play and will now wait for the C.I.F. Division 1 playoff brackets to be released this weekend. WARREN BOYS BASKETBALL: The Warren High School boys’ basketball team currently has an overall record of 17-6 and a San Gabriel Valley League record of 7-2. The Bears defeated Paramount at Warren 94-60 on January 23rd, defeated Gahr at Gahr 75-63 on January 25th and defeated cross-town rival Downey at Warren 57-55 on Tuesday night. The Bears concluded their regular season schedule yesterday when they traveled to Dominguez (score unavailable at press time). Warren has already qualified for postseason play and will find out who they play this weekend. Coach Leflore, his staff and players are all looking forward to finishing league play on a strong note and making a deep run in the C.I.F. Division 3AA playoffs. WARREN GIRLS BASKETBALL: The Warren High School girls’ basketball team currently has an overall record of 10-13 and a San Gabriel Valley League record of 5-4. The Lady Bears defeated Paramount at Warren 71-34 on January 23rd, defeated Gahr at Warren 60-43 on January 25th and were defeated by Downey at Warren 63-48 on Tuesday. Warren concluded their regular season yesterday when they traveled to Dominguez (score unavailable at press time). At the time of this writing, Downey and Lynwood are tied for first place in league play with records of 8-1, Warren is in third place with a record of 5-4, Dominguez is in fourth place with a record of 4-5, Gahr is in fifth place with a record of 2-7 and Paramount is in sixth place with a record of 0-9. Warren will find out who and where they play this weekend in the C.I.F. Division 2AA playoffs. A win against Dominguez yesterday would certainly help the Bears in regards to who they play in the first round. Can the Rams' offense overcome Brady's greatness? The Los Angeles Rams are heading to Atlanta to face off with the New England Patriots in Super Bowl 53 as -2.5 point underdogs, according to Vegas. Although it seems like Tom Brady and Bill Belichick are in every year, it is the first time in over three decades that Los Angeles has a team in the big game. Flashback to just three years ago-- Los Angelenos didn’t even have a football team to root for, let alone two playoff teams. But we are back baby! It is easy to dismiss the emerging Rams by saying this will be a lop-sided advantage for the seasoned Patriots, who have utterly dominated the playoffs for nearly two decades, but according to the ‘Madden 19’ simulation, the Rams are going to edge New England, 30-27. The simulation has a proven track record and has been impressively accurate over the years. It has predicted 10 of the last 15 Super Bowl Champs and has even accurately predicted the final scores twice since they began doing the simulation in 2004. But in order for the Rams to reign victorious and host a championship parade in LA, they will need to put together four good quarters of football and maybe even overtime. They need to look like they did in the second half against the Saints in the NFC Championship for the entirety of the game if they want to beat Belichick and company, though according to the EA Sports simulation, they will have to rally to come back from a 17-3 halftime deficit. In reality, the Rams will obviously need a great game out of Goff and Gurley, both, to stand a fighting chance on offense, while Aaron Donald and Ndamukong Suh will need to push the pocket into Brady’s comfort zone quickly and often. The game will be won in the trenches and very much depends on the Rams offensive and defensive lines. If LA’s big men are beat at the point of attack and can not get a push, it will certainly be a long day for Sean McVay and his coaching staff. For Brady, this will be his unprecedented 40th playoff start and his chance at winning his sixth ring. He threw his first playoff touchdown pass 17 years ago against the St. Louis Rams in Super Bowl 36 when he won his first ship. It seems as though Brady just keeps getting better with age. He has won 11 playoff games in the last five seasons alone and has more playoff wins under his belt than some NFL franchises. I believe the Rams will need to put up more than 30 points to beat these guys. I predict a Patriot win, unless the Rams can put up 35 or more points. 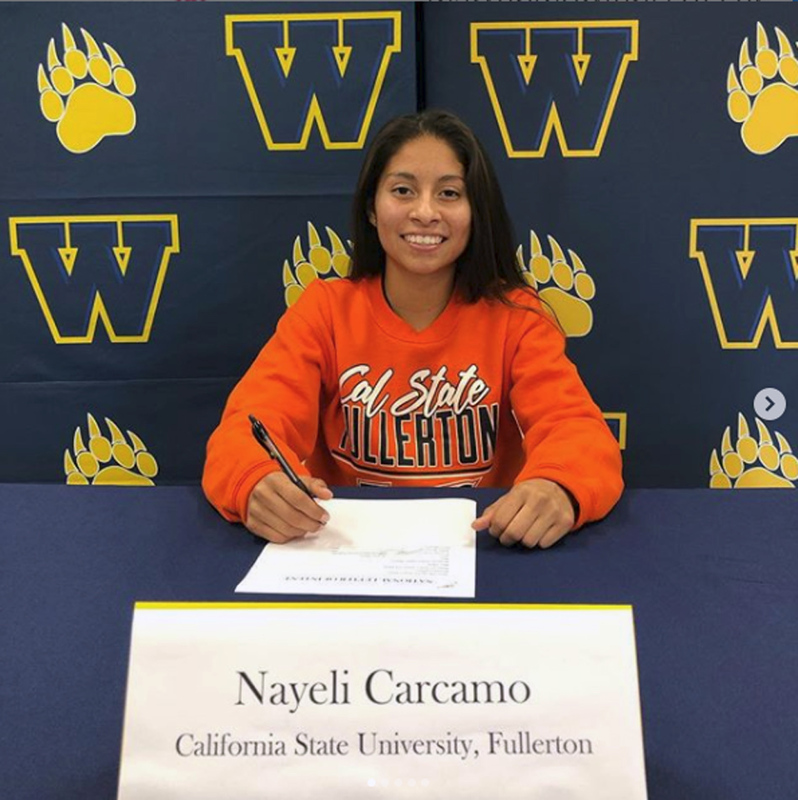 Warren High senior Nayeli Carcamo will play soccer for Cal State Fullerton after signing a letter of intent last week. The signing ceremony was attended by Nayeli’s coaches and teammates. Photo courtesy Warren High soccer. DOWNEY – The Warren High School girls’ soccer team currently has an overall record of 15-5-3 and are 7-0 in San Gabriel Valley League play. Warren defeated Dominguez at Dominguez 5-0 on January 15th and defeated Lynwood at Lynwood 1-0 on January 17th. The Lady Bears are still undefeated in league competition. The Lady Bears defeated Paramount at Paramount 4-1 on Tuesday night and hosted Gahr at Warren yesterday (score unavailable at press time). Warren will travel to cross-town rival Downey for their highly-anticipated rematch on Monday and will host Dominguez at Warren next Wednesday in their league finale. At the time of this writing, Warren is 7-0 in league and 15-5-3 overall, Downey is 5-1 in league and 11-5-4 overall and Gahr is 4-3 in league and 7-8-2 overall. Lynwood is 3-4 in league and 8-13-4 overall, Paramount is 1-5 in league and 8-10-1 overall and Dominguez is 0-7 in league and 4-9-0 overall. Coach Dussan, her staff and players are all looking forward to the last week of league play and clinching a league championship. The Lady Bears are also looking to make a deeper run in postseason play. Last season, Warren was defeated by San Luis Obispo at Warren 2-1 in the second round of the C.I.F. Division 2 playoffs. WARREN BOYS SOCCER: The Warren High School boys’ soccer team is currently 5-13-2 overall and 2-5 in San Gabriel Valley League play. The Bears defeated Dominguez at Warren 3-1 on January 15th, were defeated by Lynwood at Warren 2-1 in double overtime on January 17th and were defeated by Bell Gardens at Warren on Saturday, January 19th, in a non-league game. The Bears were defeated by Paramount at Warren 2-1 on Tuesday night and hosted Gahr at Warren on yesterday (score unavailable at press time). Warren will travel to cross-town rival Downey for their rematch against the Vikings next Monday and will travel to Dominguez to play the Dons in their league finale next Wednesday. At the time of this writing, Paramount is 5-0-1 and 13-3-3 overall, Downey is 4-0-1 and 14-4-3 overall and Lynwood is 5-2 and 15-5-5 overall. Dominguez is 2-4 and 3-10-1 overall, Warren is 2-5 and 5-13-2 overall and Gahr is 0-7 and 0-12-1 overall. A lot will certainly be determined in league play during the next week. Coach Pena, his staff and players are all looking forward to finishing league play on a strong note and making a push for C.I.F. postseason play. Last season, Warren was defeated by San Clemente at Warren 1-0 in the quarterfinal round of the C.I.F. Division 1 playoffs. DOWNEY GIRLS WRESTLING: The Downey High School girls’ wrestling team defeated Paramount at Paramount last Thursday night 37-24. With the win the Lady Vikings have now defeated their two toughest opponents, Warren and Paramount, and are now a dual meet against Dominguez away from a San Gabriel Valley League championship. In the Downey/Paramount match, Downey took an early 6-0 lead with a pin against the Lady Pirates at 106 pounds. Paramount answered back with a win at 113 pounds, but still trailed 6-3. Paramount pinned at 116 pounds and took the lead at 9-6. The Lady Vikings secured a four-point win at 121 pounds and took the lead back at 10-9. Downey earned six points at 126 and extended their lead to 16-9. The Lady Vikings then won a decision at 131 pounds and led 19-9. Downey earned six more points at 137 pounds and started to pull away at 25-9. At this point in the match, seven of 13 matches had been completed. The Lady Vikings were defeated at 143 pounds and Paramount brought the score to 25-12. The Lady Vikings earned six point wins at 150 and 160 pounds, respectively, to all but win the match at 37-12. The Lady Pirates earned six points at 170, both teams forfeited the 189 pound weight class and Paramount pinned at heavyweight to close out the match at 37-24. Coach Rios and his staff are extremely proud of how well his wrestlers competed. The Lady Vikings were scheduled to compete at John Glenn High School in Norwalk on Saturday (results will be available in next week’s Patriot). DOWNEY BOYS BASKETBALL: The Downey High School boys’ basketball team currently has an overall record of 18-6 and are 4-2 in San Gabriel Valley League play. The Vikings defeated Gahr at Downey 61-47 on January 16th and defeated Paramount at Downey 62-58 on January 18th in their last two league games. Downey is on a modest two game league winning streak after starting their season 12-0. Downey traveled to Dominguez on Wednesday (score unavailable at press time) and will host Lynwood at Downey later today. The Vikings will travel to cross-town rival Warren next Tuesday for their highly-anticipated rematch and will conclude their regular season when they travel to Gahr next Thursday night. At the time of this writing, there is a three-way tie for first place in the S.G.V.L. standings. Warren is 4-2 (14-6 overall), Downey is 4-2 (18-6 overall) and Dominguez is 4-2 (13-11 overall). Lynwood is 2-4 (8-15 overall), Gahr is 2-4 (13-11 overall) and Paramount is 2-4 (11-13 overall). Two games separate all six teams. Things are certainly tight in league play and the next week will determine who qualifies for postseason play and who does not. Coach Shelton, his staff and players are all looking forward to the final week of S.G.V.L competition and qualifying for the C.I.F. playoffs. DOWNEY – Former Downey High School standout water polo player Alejandra Villa was selected as the South Coast Conference M.V.P. for the 2018 season. The 2018 D.H.S. graduate and Long Beach City College freshman center is being recognized “for her ability to perform on both offense and defense. Long Beach City College has won the South Coast Conference championship four years in a row. Head coach Chris Oeding has been selected as the SCC Coach of the Year three times in a row and eight times overall. Teammates Sydney Brightenburg (attacker), Cam Rosas (goalkeeper), Samantha Martinez (driver) and Madison Hinojosa (attacker) were all selected to the first team. Harlie Wheelan (attacker) and Karissa Qualley (driver) were selected to the second team. WARREN BOYS BASKETBALL: The Warren High School boys’ basketball team currently has an overall record of 11-5 and are 1-1 in San Gabriel Valley League play. The Bears recently competed in the Torrey Pines Holiday Classic Tournament over Christmas Break where they finished with a record of 2-2. The Bears were defeated by Sonora 52-42 in their first game on December 26th, defeated Gig Harbor of Washington 52-47 in their second game on December 27th, defeated Crean Lutheran 65-53 in their third game on December 28th and were defeated by Gahr 61-51 in their fourth and final tournament game on December 29th. Warren defeated Lynwood at Lynwood last Friday night 72-65 and were narrowly defeated by Paramount at Paramount 50-49 on Monday night. The Bears hosted Gahr at Warren on Wednesday night (score unavailable at press time) and will travel to cross-town rival Downey later today for the first of their two anticipated league games. Warren will host Dominguez at Warren next Wednesday night to complete the first round of league play. Coach Leflore, his staff and players are all looking forward to competing for a S.G.V.L. title and qualifying for postseason play. WARREN GIRLS SOCCER: The Warren High School girls’ soccer team currently has an overall record of 10-5-3 and a San Gabriel Valley League record of 2-0. The Lady Bears recently competed in the North Orange County Tournament over the Christmas Break and finished with a record of 3-1. Warren defeated La Serna 1-0 in their first game, defeated Valencia 4-1 in their second game, were defeated by Upland 6-0 in their third game and defeated cross-town rival Downey 2-1 in their fourth and final game. The Lady Bears defeated Lynwood at Warren 2-1 on January 2nd and defeated Paramount at Warren 7-0 on January 4th. Warren traveled to Gahr on Tuesday night and defeated the Lady Gladiators 2-1 and also hosted cross-town rival Downey at Warren last night (score unavailable at press time). The Lady Bears will travel to Dominguez to play the Lady Dons next Tuesday to complete their first round of league play. Coach Lily Dussan, her staff and players are all looking forward to league play and competing for another league title. The Lady Bears are also looking forward to qualifying for postseason play and making a deeper run in the C.I.F. Division 2 playoffs. DOWNEY BOYS BASKETBALL: The Downey High School boys’ basketball team currently has an overall record of 14-5 and are 1-1 in San Gabriel Valley League play. The Vikings competed in the Rancho Mirage Holiday Classic over the Christmas Break and finished the tournament with a record of 2-2. The Vikings were defeated by Thousand Oaks 55-52 on December 26th in their first game, defeated Whitney of Rocklin 66-58 on December 27th in their second game, defeated Del Sol of Las Vegas 51-49 on December 28th in their third game and were defeated by Dana Hills 37-36 on December 29th in their fourth and final game. Downey was defeated by Paramount at Paramount 59-57 on January 4th and defeated Dominguez at Downey on Monday night. The Vikings traveled to Lynwood on Wednesday night to face the Knights (score unavailable at press time) and will host cross-town rival Warren tonight at Downey in the first of two highly anticipated league games. Coach Shelton, his staff and players are all looking forward to league play and competing for a league title and a line on a C.I.F. postseason bracket. DOWNEY BOYS WRESTLING: The Downey High School wrestling team defeated cross-town rival Warren at Downey on Tuesday night 33-33, via criteria decision. It appeared as though Warren had won the match 34-33, however, a team point was deducted from the Bears due to a sportsmanship issue. The first criteria to settle a tie in C.I.F. competition is sportsmanship. As a result, Downey won via a criteria decision based on sportsmanship. The full results of the match were not available at press time but will be available next week. DOWNEY GIRLS WRESTLING: The Downey High School girls’ wrestling team defeated cross-town rival Warren at Downey on Tuesday night 41-33. Match results were not available at press time but will be available next week. Coach Rios and his staff are very pleased with the effort of his team. The Lady Vikings hosted Gahr at Downey on Thursday night (score unavailable at press time). The former Long Beach Poly coach helped turn around a football program in disarray. DOWNEY – The Warren High School wrestling team has been busy this preseason participating in several tournaments. The Bears competed in the Spartan Classic Kick-off at South Torrance on Nov. 24 where they finished fourth overall with a total of 130 points. Villa Park finished first with a total of 241 points, Paramount finished second with a total of 150 points, South Torrance finished third with a total of 130.5 points and West Torrance finished fifth with a total of 116 points, respectively. The Bears had six wrestlers place in the top six of their respective weight classes. Warren’s Josh Mariscal finished third at 106 pounds, Carlos Durazo finished second at 113 pounds and Salvador Alvarez finished sixth at 120 pounds. Joel Gutierrez finished sixth at 152 pounds, Naethan Guerrero finished sixth at 182 pounds and Kaleb McIntyre finished fifth at 220 pounds. Warren also competed in the Millikan Duals on December 1. The Bears competed in the Edison Beach Bash December 7-8 at Edison High School in Huntington Beach. Warren finished in 13th place overall with a total of 81 points. Rowland finished first with a total of 213 points, Mayfair finished second with a total of 205 points, La Quinta finished third with a total of 182.5 points, Edison finished fourth with a total of 137 points and Beaumont finished fifth with a total of 135 points, respectively. Warren had five wrestlers place in the top eight of their respective weight classes. Andrew Lopez placed second at 106 pounds and Joshua Mariscal placed third at 106 pounds. Salvador Alvarez placed third at 120 pounds, Andrew Martinez placed eighth at 160 pounds and Naethan Guerrero placed fourth at 182 pounds. The Warren High School wrestling team competed in the Mann Classic at Marina High School on Dec. 14-15. The Bears finished in 29th place overall with a total of 42.5 points. Servite finished first with a total of 259.5 points, Bakersfield finished second with a total of 220.5 points, Villa Park finished third with a total of 179.5 points, Fountain Valley finished fourth with a total of 159.5 points and Calvary Chapel finished fifth with a total of 138.5 points, respectively. The Bears had two wrestlers place in the top eight of their respective weight classes. Carlos Vasquez placed fifth at 106 pounds and Salvador Alvarez placed fifth at 120 pounds. The Warren wrestling team also participated in the Ed Springs Classic Wrestling Tournament December 21st and 22nd at Brea-Olinda High School. The Bears finished in eighth place overall with a total of 102 points. Photo courtesy Warren High wrestling. Valencia finished first with a total of 176 points, Sonora finished second with a total of 148 points, Dos Pueblos finished third with a total of 131.5 points, Brea-Olinda finished fourth with a total of 128 points and Aliso Niguel finished fifth with a total of 117.5 points, respectively. The Bears had six wrestlers place in the top eight of their respective weight classes. Joshua Mariscal placed seventh at 106 pounds, Carlos Vasquez placed third at 113 pounds and Salvador Alvarez placed fifth at 120 pounds. Carlos Durazo placed third at 160 pounds, Troy Garza placed sixth at 170 pounds and Kaleb McIntyre placed eighth at 195 pounds. Warren will begin their league match schedule when they host Gahr at Warren on January 3. The Bears will then travel to cross-town rival Downey on January 8, will host Dominguez at Warren on January 10th and will travel to Paramount to face the Pirates on January 22nd. Downey and Paramount will once again be the teams to beat in league competition. Warren is scheduled to wrestle in the Tournament of Champions at Cerritos College on January 5 and the La Puente Duals on January 12. Coach Brogden, his staff and wrestlers are all looking forward to competing for a S.G.V.L. and C.I.F. championship. DOWNEY WRESTLING: The Downey High School wrestling team has been busy this preseason getting ready for the start of their league dual match schedule, competing in the Edison Beach Bash at Edison High School in Huntington Beach on Dec. 7-8. Downey finished in eighth place overall with a total of 115 points. The Vikings had five wrestlers finish in the top eight of their respective weight classes. Matthew Mendoza placed eighth at 113 pounds, Isaac Medina placed seventh at 126 pounds, Josh Burtle finished eighth at 138 pounds, Matthew Rauno finished fifth at 160 pounds and Nelson Cruz finished second at 220 pounds. Rowland was the Edison Beach Bash Tournament champion with 213 points, respectively. Downey finished eighth and cross-town rival Warren finished 13th. The Vikings also hosted the Downey 32 Way Varsity Tournament December 14th and 15th. Downey finished in ninth place overall with a total of 64 points. Paramount finished first with a total of 116.5 points, Monache finished second with a total of 97 points, Arroyo finished third with a total of 92.5 points, Beaumont finished fourth with a total of 89 points and Millikan finished fifth with a total of 85.5 points, respectively. Downey had one wrestler qualify for the semifinals and that was Isaac Medina at 126 pounds. Other Viking wrestlers were in the mix but did not finish in the top two (bout sheet was incomplete at press time). New Viking head coach Kyle Acevedo, his staff and wrestlers are all looking forward to league competition. Cross-town rival Warren and Paramount will be the teams to beat in San Gabriel Valley League dual meet action. DOWNEY BOYS SOCCER: The Downey High School boys’ soccer team currently has an overall record of 5-1-2 and will begin league play next week. In recent competition, the Vikings defeated Los Alamitos 4-1 at Downey on December 13, defeated Alisal of Salinas (California) 1-0 at Downey on December 14, defeated El Toro 2-0 at Downey on December 15 and defeated Schurr of Montebello 2-1 at Downey on December 18. The Vikings are scheduled to compete in the Arizona Showcase beginning tomorrow and will play Hamilton of Arizona in their tournament opener. Downey will also compete in the Flower Mound Marcus Tournament against Naaman Forest of Garland, Texas, on January 3. The Vikings will then begin San Gabriel Valley League play when they host Dominguez at Downey on January 4th. Downey will then travel to Lynwood to play the Knights on January 8th and also travel to cross-town rival Warren to play the Bears on January 10th. The Vikings will then host Gahr at Downey on January 15th and also host Paramount at Downey on January 17th. Paramount and Warren will once again be the teams to beat in league play. Head coach Marvin Mires, his staff and players are all looking forward to the start of San Gabriel Valley League play and competing for another league championship. The Vikings are the 2018 S.G.V.L. champions. Downey is also looking forward to qualifying for and making a deeper run in the C.I.F. Division One playoffs. DOWNEY — Paloma Usquiano, a Downey resident and senior at Orange Lutheran High School , has committed to play softball at the University of Arkansas. Usquiano is part of the Razorbacks’ 2019 signing class, which also featured standout players Jenna Bloom and Rylin Hedgecock. Usquiano is a 5-ft., 5-in. Infielder who batted over .350 in each of her sophomore and junior seasons, including a .435 average during her sophomore campaign. She belongs to the So Cal Athletics Jendro travel ball team, batting .350 and .360 during her sophomore and junior seasons, respectively. She is the daughter of Downey residents Armando and Dianna Usquiano, and has two sisters, Sofia and Julie. DOWNEY – The Downey High School boys’ basketball team is currently 12-1 and off to their best start since the 1979 season. The Vikings suffered their only loss of the season against Bellflower in the Buc Pride Tournament last week. Downey finished the tournament with a record of 3-1. After falling to Bellflower 51-49 in their first game on December 10th, the Vikings defeated Cantwell-Sacred Heart of Mary 101-28 in their second game on December 11th, defeated Renaissance Academy 62-43 in their third game on December 13th and defeated Norwalk 67-46 in their fourth and final game on December 15th. Downey traveled to Staples Center to play Cerritos (4-8) last night (score unavailable at press time) and will compete in the Rancho Mirage Holiday Classic Tournament over the Christmas Break. The Vikings are scheduled to play Thousand Oaks on December 26th and Whitney of Rocklin on December 27th. Later games in this tournament will be determined based on early tournament results. Downey will begin San Gabriel Valley League play when they travel to Paramount to play the Pirates on January 4th. Coach Shelton, his staff and players are all looking forward to the start of league play, competing for a league title and making a deep run in the C.I.F. Division 3AA playoffs. The Vikings are currently ranked second in Division 3AA. WARREN GIRLS BASKETBALL: The Warren High School girls’ basketball team currently has an overall record of 2-6 and will begin San Gabriel Valley League play in early January. In recent preseason play, the Lady Bears defeated Orange Lutheran at Orange Lutheran 43-42 on December 12. Warren is currently competing in the Tournament of Champions being held December 19-22. The Lady Bears were defeated by Desert Ridge 44-33 on Wednesday and have other games scheduled for December 20th, 21st and 22nd against opponents to be determined based on earlier tournament results. The Lady Bears are also scheduled to compete in the Larry Doyle Tournament December 26-29. Warren is scheduled to play Hawthorne in their first game on December 26th and other opponents will be scheduled based on other early tournament results. Warren will begin league play when they travel to Lynwood to play the Lady Knights on January 4th, when they travel to Paramount on January 7th, when they host Gahr at Warren on January 9th and when they travel to cross-town rival Downey on January 11th. Coach Palmer, her staff and players are all looking forward to the start of league play, competing for a league title and making another run to a championship in C.I.F. Division 2AA postseason play. WARREN BOYS SOCCER: The Warren High School boys’ soccer team currently has an overall record of 3-5-1 and will begin San Gabriel Valley League play in early January. The Bears competed in the Santa Barbara Showcase Tournament December 7th and 8th where they finished with a record of 0-1-1. Warren tied San Marcos of Santa Barbara 2-2 in their first game on December 7th and were defeated by Concord De La Salle 2-0 in their second game on December 8th. In non-tournament play, the Bears were defeated by Edison at Warren 1-0 on December 13th. Warren also competed in the Adidas West Coast Showcase in Santa Barbara where they finished with a record of 1-2. The Bears defeated El Rancho 1-0 on December 14th at 5 p.m. and were defeated by Katella 4-0 the same day at 6 p.m. Warren was also defeated by Hamilton of Chandler, Arizona, 4-1 on December 15th. The Bears played Katella for the second time in five days at Warren yesterday (score unavailable at press time) and will begin league play when they travel to Lynwood on January 2nd. Warren is also scheduled to play Paramount at Paramount on January 4th, Gahr at Warren on January 8th, and cross-town rival Downey at Warren on January 10th. Coach Pena, his staff and players are all looking forward to the start of league play, competing for a league title and making a deep run in the C.I.F. Division 1 playoffs. DOWNEY GIRLS SOCCER: The Downey High School girls’ soccer team currently has a record of 6-3-1. The Lady Vikings were defeated by JSerra at JSerra 5-0 on December 11th and defeated North Torrance at North Torrance 5-2 on December 13th. Downey defeated Millikan 1-1 (5-4 PK’s) on December 15th and defeated Millikan 1-0 on the same day in the Best in the West Tournament at Rio Hondo College. The Lady Vikings defeated Arcadia at Downey 2-1 on Tuesday and will compete in the North Orange County Classic Tournament over the Christmas Break. Downey is scheduled to play La Mirada on December 27th at 11:00 a.m. and Oxnard on the same day at 4:00 p.m. The Lady Vikings will play their third game of the tournament on December 28th when they play Sherman Oaks Notre Dame at 11:00 a.m.
Downey will travel to Dominguez for their league opener against the Lady Dons on January 4th, will host Paramount at Downey on January 5th and will host Lynwood at Downey on January 8th. The Lady Vikings will then travel to cross town rival Warren for their highly-anticipated bragging rights game on January 10th. Coach Aguiniga, his staff and players are all looking forward to the start of San Gabriel Valley League play, competing for a league title and making a deep run in the C.I.F. Division 3 playoffs. Warren remains the team to beat in league play.